Coming out of the subway station at Courtland, just a block away from Zuccotti Park, the first thing I notice is the towering presence of two skyscrapers still under construction. 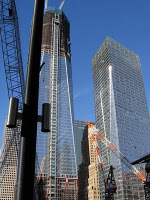 This is the defiant Freedom Tower – the phoenix rising from the tragic ashes of the 9/11 attacks. Shimmering and reflective against the shocking blue October skies. A statement that the US cannot be broken. We will rise again, rebuild and remain a power that touches the world. I didn’t realize that the Occupy Wall Street protests were taking place across the street from Ground Zero. But then again– there was a lot I didn’t realize before I started this improvised pilgrimage to the heart of our US Spring. I didn’t realize that Zuccotti Park is just one city block. Maybe three-quarters of an acre. Frankly – it is less than half the size of the land I live on by myself in New Mexico. Yet the actions happening on that one block in New York City seem to be rippling across the universe. Standing on the corner of Liberty and Trinity, the Freedom Towers to one side of me, the Occupy Wall Street protests on the other, I can’t help but wonder. What is it about this place? That in ten years’ time, two events have happened here that have impacted the psyche of the entire world? I spend the better part of an entire day at Zuccotti Park. Looking around. Listening. Taking pictures. Talking. Witnessing. By the end of the day, I get a sense of why the mainstream media can’t get their head around what’s happening here. And why such a large percentage of the US population is cheering these folks on. There’s the girl who is a medical assistant. She’s 24. Had a job in the medical field in Maryland that left her feeling empty. 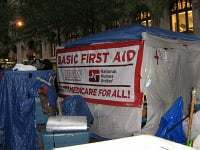 She quit her job and showed up at OWS to volunteer at the medical tent. With 90 bucks in her pocket and a cell phone whose charge had run out. Handing out Vitamin C tablets to the protesters who ask for them – she feels like she’s doing something important. She’s excited. She’s on fire. She’s empowered to be doing actual health “care” – where the “caring” is part of the role. There’s another guy. Young and clean cut, with piercing blue eyes and a strong build. He has a tent, a knapsack, a laptop and a digital camera. He asks to take my picture because – let’s face it – with my white turban and white clothes, I stand out a little. We start talking. He’s been unemployed for the last four months. Living out of his car. Traveling from one Occupy protest to another. He’s experiencing and documenting the events in his own way because he doesn’t have anything else to do. I look at him and think – this is the face of the new displaced. They carry their belongings on their backs. But they are educated. They are digital. They are connected to each other, and they are a force to be reckoned with. I walk through the park and walk around the park. Again and again and again. A picture starts to emerge. It’s complex. We’ve heard about flash mobs – connecting for a few minutes or a few hours for a specific purpose. Then disappearing back from where they came. This place – this Occupy Wall Street – is a flash town. It’s a living fractal of the kind of society these folks would like to create. That a lot of people would like to create. The infrastructure, the organization – they are experimenting and modeling for themselves what they’d like to see society become. The Medical Tent. With doctors, nurses, and chiropractors that do have jobs. Yet they volunteer their time to take care of the protesters and anyone else who shows up. The Food Tent. Where they collect food donations, prepare meals, feed people. Feed the protesters. Feed the homeless. Feed the visitors. Feed anyone who comes along. The Comfort Tent. Where they hand out clothes to people – blankets, coats, shoes, socks. Making sure that folks have what they need. The Free Library. So many books being donated and lent out. Not just to the protesters – but to the crowds that meander through the park hour after hour. It’s open to them, too. The OWS Day Care. A little corner set up for the moms to look after their small children. The Media Tent. The Legal Tent. The Community Affairs Tent – if you want to know the schedule for the day. The Sanitation area – where the brooms and buckets are kept. The park was squeaky clean. 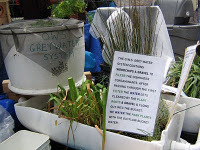 The gray water system display – illustrating how the water they use to clean the dishes is being recycled to water the plants in the park. It goes on and on. A tiny little town within a square block, covering every human need. Fueled by volunteers, donations, and a fierce conviction that we can engineer a society where everybody gets taken care of. Complexity. It doesn’t lend itself easily to sound bites. Of course – all of the infrastructure would be pointless if there wasn’t something happening. Once again, “what’s happening” defies simple summaries. There are so many people converging in this one place, with so many different ideas. There’s no lack of things to do. Every day, there’s at least one if not two marches organized somewhere for some purpose. The visible protest – with signs and people. The morning I arrived, a group had just donned Robin Hood costumes. 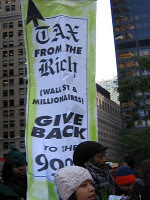 They marched with signs saying, “Tax the Rich.” It was theatrical. It was New York. And it got a simple point across. Yet to say that this point, “Tax the Rich” is THE point is not to be paying attention. That was one event. There were dozens and dozens of events happening all day long. Free workshops offered on a range of topics: from non-violent communication, ala Marshal Rosenberg; to protecting yourself from predatory lenders. Political action tables set up in the park. You can register to vote. Sign a petition supporting the Buffet Tax. Sign another petition to help keep US Post Offices open. And if you need a Public Notary? She there from 3-5 pm. There’s the space for everyone to make a sign. For everyone to give voice to their thoughts. A lot of these protestors don’t sleep in the park. They show up for a while with their signs, and then go home when they’re done. One older man I spoke with wore a sandwich board that he obviously made himself. No flashy symbols or catch phrases. He had a rather crowded outline of what he thinks we need to be paying attention to. What fascinated me the most was how much more crowded the sidewalk became after business hours. You could see those people who, dressed very professionally, simply came by the protest on their way home from work. They added their signs and voices to the mix. The Think Tank met for 3 hours. They took a ten minute break, came back and kept going. Every single person involved was sitting on the edge of their seats, smiling, engaged, excited because they finally realized – hey, I’m not alone. It might annoy the heck out of the nearby businesses. 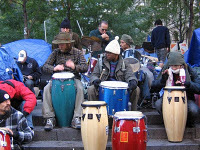 But that drum circle keeps the attention on Zuccotti Park. Mobs of people line the street while they play, taking pictures and becoming curious. The more difficult aspects. The homeless. The pan-handlers. The mentally ill. Of course they are coming, too. Free food, free medical care, free warm clothes – who needs it more than they do? It would be easy to walk through the park, taking pictures of those people, and making them the face of the movement. By my estimation, this shadow side constitutes about maybe 5% of what’s happening there. 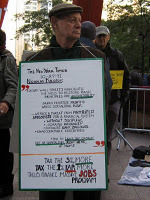 To their credit, the OWS protestors are doing everything they can to manage these folks with dignity. The interactions with the police. Both sides seem to be working very consciously to keep a dialogue going. There’s a dynamic tension at play. Cops are stationed on every side of the park. They maintain a certain distance, keep the foot traffic moving, and ask the protestors to change things with the camp if they perceive anything as hazardous. Some police officers wear vests that say, “Community Affairs Liaison.” There have been meetings between the protestors and representatives of the local neighborhoods. The amount of drumming going on has been a big issue. It’s all about boundaries. Inside the park, a new world is being birthed, and it revels in the joy of its own existence. But a couple blocks away, New Yorkers and visitors are going about their daily life, oblivious to the social experiment taking place under the Freedom Tower. 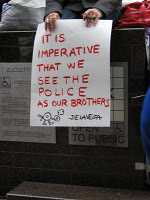 The police represent – physically and psychologically – the boundary line between those two worlds. Then, of course, there’s the spiritual aspect. On the corner of Liberty and Trinity, there is a simple tree at the center of a circle of marble benches. One of the protestors took it upon himself to create a sacred space around the tree. The protestors named the tree, The Tree of Life. 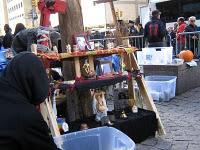 There are small wooden shelves placed around the tree housing symbols from every possible religious and spiritual tradition – known and unknown. It’s universal. It’s open. And it serves as a spiritual sanctuary. One of the people who created this sacred space watches over it as his contribution to the protests. “One day,” he said, “the yogis showed up.” Fateh Singh Khalsa, Hari Simran Singh Khalsa (who was featured in Time Magazine), Himmat Singh Khalsa and others. A group of Kundalini Yoga teachers, many of whom also happen to be Sikhs. They were inspired to come every evening and lead a Kundalini Yoga class for those in the camp who wanted to attend. They call themselves Occupy Yoga. The “People’s Microphone” has been written about in other articles covering the protests. The yoga class works the same way. Sat Jagat Singh Khalsa, the head of the 3HO Brooklyn Ashram in NYC and co-founder of Kundalini Yoga in Park Slope, stands on one of the marble benches. He begins to explain the Kundalini Yoga exercises to those who are gathered there. His son, Hari Simran Singh, myself and others repeat the instructions in a loud voice. That way, the crowd which has gathered around can hear. Some moments are too precious to put into words. The day ends the way it began. In the presence of the OWS protestors. Looking up at the emerging Freedom Tower. 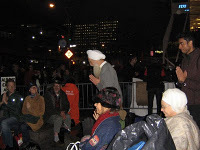 Sat Jagat Singh teaches a simple healing meditation as night falls. The Freedom Tower is the back-drop. There’s no way to express what it was like sitting there, across from Ground Zero, praying for healing with people who believe that we can build a better world. A more fair world. A more compassionate world. And who believe it enough to put themselves on the line. It’s a one-in-a-million moment. The sound of the chanting. The reminder of what happened 10 years ago. The realization that the spirit to heal the problems we face has been inside us all along, and is coming to life. 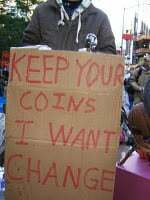 I don’t know what the end result of Occupy Wall Street will be. But I do know, day by day and moment by moment, there are conversations, prayers, connections and ideas happening here whose ripple effects will far outlast the life span of the protest, themselves. if everyone have there on ideas and different paths, it will not work because they are not united how can they unite others, all the group should first select a topic and do action on it. if everyone think differently how can this world be stronger, its just like breaking one stick is easier than breaking many.